There's nothing CPS3 (SFIII or Jojo or Warzard/Red Earth) about it. You need to look at the actual sprites as reference. Not the CvS sprites and not Street Fighter Alpha sprites. The proportions are odd, with very long arms and very big hands and feet. Is his height okay? It looks like his legs are short too. The shading is a mix between SFA and CvS. Ok ,ahm, what about now? You didn't fix much actually. The shading still doesn't resemble sf3 sprites. As Alex said - it looks like a mixture of cvs and cps2. Also the sprite itself is too small. It's size is about 2/3 of a regular sf3 character. You didn't fix the proportins as well. They look really bad. Use references to get a proper glimpse of how it should look. I don't want to discourage you from making sprites. Keep your work up and you'll get better eventually. You're doing excelent work with cvs takuma/mr. karate. 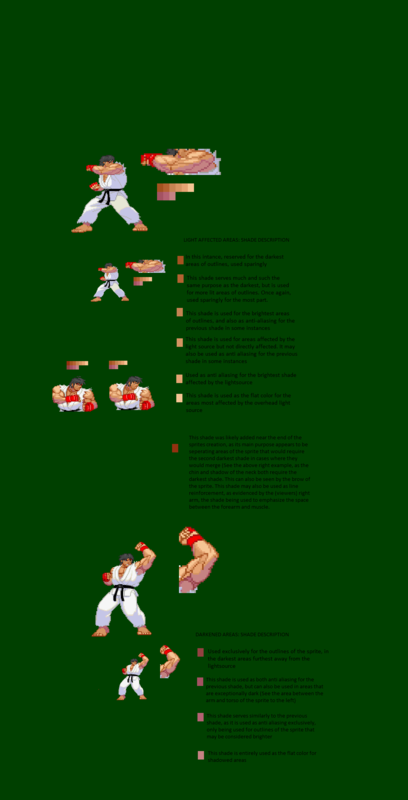 Here's a great tutorial on how to make sf3 sprites. You may find it useful. Tried something. Would love to get feedback. For now it looks rather sketchy. Size and proportions look pretty good (maybe he's a bit to big) but you should focus on the shading. There's a lot of space for improvement in that matter. You can take a look at Omega eFeX's sprite and use it as a reference. Also check Steamboy's tutorial I posted above your post. Keep it up. I would love to see it finished. I did follow the tutorial. I don't do these kinds of sprites anymore, but I'll bite. 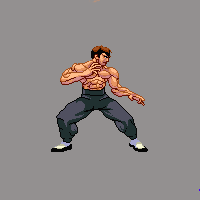 Don't copy SF4 (or SFV) anatomy to the tee when converting them to the MvC/SF3 sprite styles, because they end up looking strange. Have references around and play around with it, don't settle on a carbon copy. Urien and Gill are great references for CPS3 anatomy (and by extension, I guess Twelve and and Necro... okay maybe not Necro). Capcom also released an anatomical guide that helps a lot, especially when spriting. The colors on your sprite don't look like SF3 at all, it feels like pastel on yours, when it should have some hue variation (especially between the primary and secondary light sources), and feel lively and colorful. Try referencing existing character palettes (i.e. I used Yun and Yang as color references). I played around with the light parts a bit to make it more top-central. Didn't light the entire thing, but hopefully you can see what I'm getting at with it. A friend asked that I go an extra mile with this, so I added some extra colors and the secondary light source in certain parts. I also colored the outlines in the lit areas too. Here's hoping this all helps. Yahya Nass did great job with his edit and gave you a bunch of great tips. I suppose you have all the pieces of the puzzle now. Try to finish the sprite by yourself. Take your time. 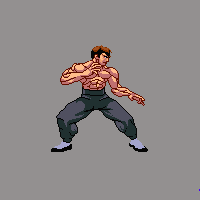 Spriting can be time consuming - especially when you make SF3 styled sprites. Sinhra's SF3 palette tutorial can be helpful as well. However, please note Chamat's comment below. Thanks for all the feedback! I tried it again using a different method. I'm still not satisfied with the hands and face. Also, the skin shadow might be too blueish. What do you think? It looks very very rough, the shadows on the face don't define it but ruin it, weird choice of colours for the skin. The (viewer's left) arm doesn't get light (arm - forearm - hand: I'm talking about the arm). I see. I'll try again sometimes. i'm thinking in no post it here... but... any help to fit it some more "close"
Proportions are ok, I think. The light source and color style are pretty on-point! Only thing that really sets her apart from the cast is the "realistic" definition from her model. Notice that, in SF3, the muscles either have a solid outline separating them, or are represented by simplistic shapes.